This dress made me ponder my creativity. When people learn that I sew, I always hear the proverbial "you are so creative"! I don't think I am that creative and this is why sewing works for me. I am very logical, analytical, and work in a career where I use those skills. I'm not one who can come up with a design or concept from scratch. I'm not good with crafty things unless there are directions to follow. I'm great at cooking, because I know how to follow the directions of a recipe. This is what sewing is to me. It's a puzzle of pieces that go together when you follow the directions. The most creative part for me is picking the right fabric, which after 25 years of sewing, is still a challenge sometimes. Sure, it's a creative outlet for me, of sorts, but I'm certainly not coming up with the designs. Take the Named Kielo Wrap Dress as a perfect example. I loved the lines of this pattern when it came out. And although there are fabric recommendations for the pattern, I could never picture it made in anything other than this semi-sheer knit the model is wearing. I knew this was not the look for me and never gave the pattern another thought. Fortunately, many lovely sewists had more fabric hutzpah than me and made the dress up in lovely, opaque jersey fabrics. Go Google images for the dress or just go to Instagram and you will be in awe of all of the great versions out there. Once I could picture this dress made up in something other than sheer fabric, I knew I needed it in my life. 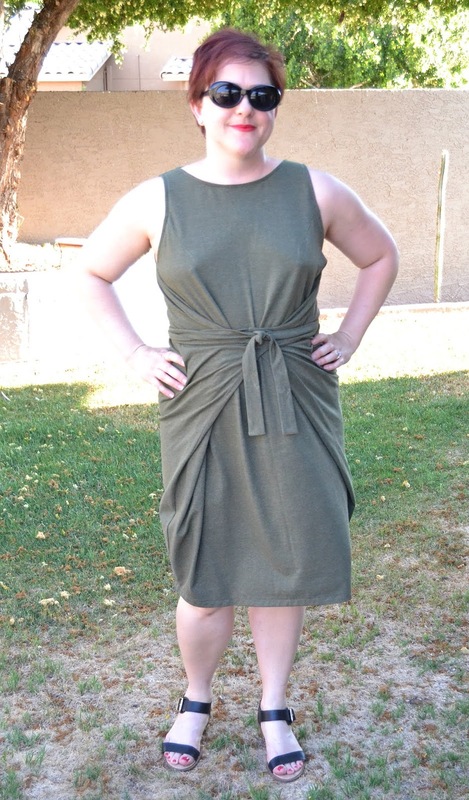 I chose a green cotton spandex from Girl Charlee fabric. I spent about $7 a yard, and needed about 2.5 yards. I made the size recommended by the pattern without adjustments. The maxi-length is not for me. I shortened the dress to hit me at the knee and left off the walking vent. I serged the majority of the seams, did what I needed to on my straight-stitch. I love the darts. Although this is a knit pattern, which tends to conform to your shape, the darts gives it a little more tailoring. The end result is fabulous. I have worn this every which way. Tied in the front, tied in the back. Out to the grocery store, business casual for work. It travels well. It is "flattering"- don't get me started on that word. I've actually come to despise it because it sends the message that our bodies need to be concealed in order to wear certain things. But if you've got a belly pooch like me or a little extra junk in the trunk, this really does look good! What about you? Do you consider yourself to be creative or a direction follower? Are you a bit of both? I agree with you on several points on this post! People always comment on what a great cook I am... but I just follow the recipe. I could never compete on cooking show. Same with sewing... follow the directions (or substitute from books). Choosing fabric and style for me is the hardest thing I do. And, flattering? It's loaded. Some styles suit some people and not others. What's flattering on you may not be on me and vice versa. Yes, choosing fabric is still such a challenge. It is so difficult for me to envision what things will look like! Your intro post is me, exactly. I have given up trying to tell non-sewers that I'm not "creative" or a "designer"...I'm highly technical. Construction of a garment is a very technical process. And do.not.get.me.started!! Flattering is so loaded. I won't even use it. Because we ALL know what the underlying intent is the vast majority of the time! I have a full rant for my future post on the Grainline Felix. It's a cute, roomy design. I, for one, don't care if it may, GASP!, make it appear as if I have a belly! The horrors! Fat on my body!!!! :eyeroll: I wear what I like. Maybe it isn't "flattering"...and? Does that matter if it makes me cheese when I look in the mirror? It really does not. Your Named dress is super duper fantastic and awesome! I hear you on the "flattering" comment. I didn't use to think twice about throwing it out there but it really can be damaging. Is my body so wrong that it needs to be flattered? Are other things I wear not flattering? Good points.